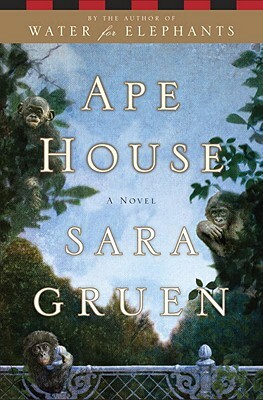 Sara Gruen's latest novel, Ape House, is at once a drastic departure from the bestselling Water for Elephants and yet completely familiar. Where Water for Elephants dove into the culture and history of the circus, Ape House explores the culture around the study of apes - particularly, bonobo apes - and their ability to learn language. The two subjects could not be more diverse, and yet Gruen tackles both with a vigor and intense curiosity that is refreshing in an author. In Ape House, Gruen tells the story of a family of bonobo apes - a family that includes their caretaker, Isabel. When their habitat is bombed in what is assumed to be an attack by animal-rights extremists, the bonobos are frightened, scattered, corralled and ultimately made to disappear. They arrive once again in the public eye with the announcement of Ape House, a television show that takes reality TV to an entirely new level, and Isabel is left to fight for their freedom - and her own - against mobs, the media, and a millionaire (no alliteration intended). The similarities between Ape House and the abysmal reality television on air today keep Gruen's novel grounded in the real world while the coincidences and sometimes complete inability of one character to understand another stretch credibility at times. But what is most engaging about Ape House is not Gruen's commentary on reality television, the state of a news-starved media industry, or the moral lows that humans are willing to go to get ahead. It is her admiration of the apes and their language and their interactions and their relationships that make Ape House stand out. Gruen has noted that this novel is based on her experience with a real family of bonobo apes at the Great Ape Trust in Iowa, and that experience - and her subsequent research - shows. Bottom line: Though somewhat disappointing after the success of Water for Elephants, Ape House is still an engaging story. Gruen is a talented writer who unfortunately stretches plausibility here a bit too far to be believable, and yet not far enough to venture into fantasy. When tallied up against the detail of the bonobo culture and the intrigue of a who-dun-it storyline unfolding, the far-fetched nature of the plot can be forgiven. Many thanks to Spiegel & Grau for an advanced review copy of this title, which I picked up (and had signed!) at BEA last year. Many apologies for taking nearly an entire year to get to it. I have to admit that I read this as an ARC and I didn't like it at all. I hadn't read Water for Elephants so I didn't have anything to compare it to or anything, and I am almost glad. Largely because I think given how much people seem to like Water for Elephants, if I had enjoyed it, I may have enjoyed this book even less than I did. I think that you hit the nail on the head with your comments about implausibility. And it just felt so formulaic. I gave it a 3 / 8. I didn't know there's a place like this in Iowa. I'll be meeting with luxury home builders there this weekend; hopefully I can swing by. Thanks for the honest review. Despite your misgivings, I just might get my own copy.